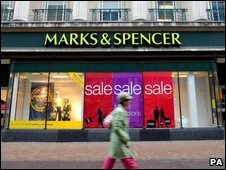 Marks and Spencer has reported a fall in sales for the fourth consecutive quarter, but its figures were better than expected. M&S said like-for-like sales in the UK - which strip out the impact of store openings and closures - were down 4.2% for the 13 weeks to 28 March. The retailer also said it was turning around its troubled food business. Like-for-like food sales were down 3.7%, while general merchandise sales - which includes clothes - fell 4.2%. The company added that it maintained market share in clothing over the full year. Overall group sales were up 1.9%, with significant increases seen in online and international sales. In January, M&S announced 1,200 job cuts and plans to close 27 stores. It intends to close 25 of its Simply Food stores and two of its regular stores. Sir Stuart admitted that there had been a downturn in food sales in the past year because the company had not been giving customers what they wanted. "We didn't give them the right innovation, we didn't give them the right value for money in some cases and we didn't give them the right promotions," he said. However, he added that food prices are now going down and the company was making progress. "We're in a plateau period," he said. "[The outlook] hasn't got any worse but there are no signs at all that it's getting any better." The decline in sales was a slowdown from that seen in the previous quarter when sales fell by 7.1%. "M&S seems to have been here before," said Richard Hunter, head of UK equities at Hargreaves Lansdown Stockbrokers. "After criticism of misguided offerings, along with the company's own admission of strategic mistakes, the turnaround seems to have begun." However, according to BBC business editor Robert Peston, the key issue is whether Sir Stuart thinks we are witnessing a structural change in the economy which will have profound implications his industry. This would be caused by consumers seeking to rebalance their finances, which would involve them saving more and spending less. Sir Stuart was "rather non-committal" on this, says Mr Peston. Sir Stuart has also been faced with increasing opposition to his dual role of chief executive and chairman. A group of shareholders at M&S have been calling for the appointment of an independent chairman by 2010. The Local Authority Pension Fund Forum believes the current situation puts too much power in the hands of one individual. However, Sir Stuart said there was no change in the board's position since last year when he took on the combined role. He is currently committed to staying with M&S until 2011.